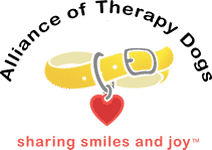 How to Handle ‘What If’ Therapy Dog Visiting Scenarios - Alliance of Therapy Dogs Inc. Therapy dogs are trained and accustomed to bringing joy to the lives of patients in need of a little extra love. Taking our caring canines across the country to help make lives brighter and more loving is a ceaseless pleasure, for both the dog and the patient they’re meeting. But in order to keep our pooches safe and able to continue playing an important in patients’ lives, we need to protect them from any potential harm or disturbance that they might encounter on the road. Here, we look at the ‘what if’ scenarios associated with taking therapy dogs into care homes, hospitals and clinics – arming you with the responses you should bear in mind in different scenarios. The first thing to be aware of is that the wide variety of patients that our canines come across can act in different and sometimes unpredictable ways. While the vast majority of patients have only love, care, and respect to show, there are inevitably those patients whose behavior is erratic, confused and potentially harmful to our dogs. As such, the first part of this guide looks at how you can mitigate unpredictable and harmful behavior from patients by being prepared for those ‘what if’ scenarios. In these situations, you need to protect the dog. Without alarming the patient or the therapy dog, gently assert that the patient should be handling their new canine friend a little more gently. If necessary, show the patient the kind of strokes that the dog likes, and have the patient copy your affectionate cuddles. If the patient seems unable to treat the dog with respect and care, you may have to remove the dog from the patient’s side. Once again, this shouldn’t be done dramatically – simply call the dog over, or gently usher them by the collar away from the patient. You can even make an excuse for leaving that will not offend the patient. For example you might say that the dog needs some water, or needs to go out to potty. The therapy dog’s physical and emotional health is an absolute priority in order for it to continue giving love to those in need – so be prepared to protect it from inappropriate touching. As a handler, your dog is your first priority. On the other hand, some circumstances can arise in which the therapy dog acts in an unpredictable and less-than-calm manner. Despite being very well trained and capable of reacting gently to a number of different stimuli, sometimes our canine friends can become a little difficult to deal with – and you need to be at hand to calm them down, taking command of the situation before it escalates. They are, after all, dogs. They are emotional beings and can have a bad day, or get overexcited, as humans do sometimes. Here, you’ll learn about the ‘what if’ scenarios involving the dog’s behavior. Sometimes on visits your therapy dog will encounter other pets. There can be no guarantee of level of discipline and training these pets have had, and other dogs can be especially difficult to manage when we bring our therapy dogs to a variety of settings in which patient pets are present. ATD requires that you keep your therapy dog at least 2 feet away from any other dog or animal when you are visiting. This is for the team’s safety (you and your dog) and to prevent confrontations that could affect the safety of those around you. The nature of these incidents changes from animal to animal, but generally you need to be alert to the fact that even the best-trained dogs can be provoked in certain situations. As such, you should be prepared to end the visit and take the therapy dog outside if there arises a scenario like those outlined above. Not only will this save a good deal of noise and commotion, but it will allow the therapy dog to feel more comfortable and relaxed after a quarrel with another pet. Being a therapy dog can entail long shifts giving and receiving joy. Another ‘what if’ situation involving your canine is the possibility of a mistimed toilet break. Always ensure that, even if the therapy dog seems to be enjoying the attention it’s receiving, you’re giving it regular breaks outside to go to the toilet, to drink some water, or to have a little treat or a meal. It’s hard not to take your eye off the ball on occasion when you’re witnessing the warming effects that a dog can have on someone in need of their love, but always bear in mind the dog’s specific needs so that it’s able to enjoy its encounters to the utmost. Finally, another important point to take consideration of is the dog’s hygiene. Some patients can be weak and vulnerable to illnesses that dogs are capable of spreading. If you do let a dog outside, always ensure it’s well washed before it returns to patients. A dog with wet paws, dirty hair or ‘dog food breath’ is not going to be as wonderful in the eyes of the patients it visits as a clearly well-maintained, healthy and clean pooch. Whenever possible, check that the therapy dog in your care has the highest level of cleanliness possible, so it’s a bundle of clean fur that patients get to enjoy without the ‘what if’ risk of their sheets getting dirty, or the risk of them catching an illness from the affectionate hound. Therapy dogs are wonderful things to introduce different patients to, but you should always care for the ‘what ifs’ that might occur on your travels. This guide should prepare you for those so that you’re safe in the knowledge that you can handle any situation that presents itself to you on the road. Can you take a therapy dog anywhere? What is the Difference Between a Therapy Dog vs a Service Dog? ATD is a non-profit 501c3 organization. We operate from member’s dues and donations. Donations help to fund the ATD Scholarship, continuing education, conferences, and other services. All donations are tax deductible. ATD is a non-profit 501c3 and all donations are tax deductible.